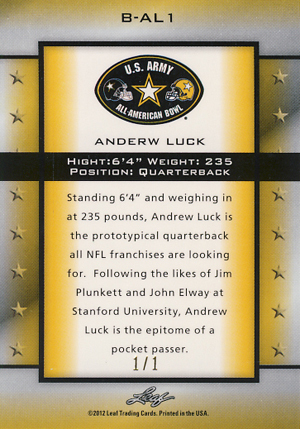 Yesterday, Leaf made a splash by offering the first licensed Andrew Luck cards. However, after a pair of spelling errors were discovered, Leaf pulled several of the auctions and promised to fix the cards before releasing them again. 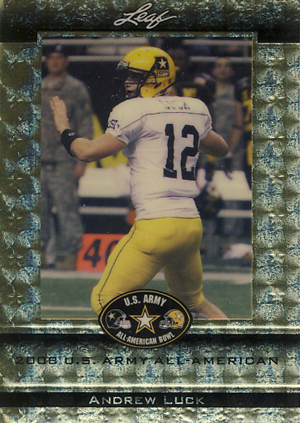 Leaf offered several different versions of Luck cards, which were licensed by the U.S. Army All-American Game. While the basic versions turned out as planned, the Prismatic versions had Luck's first name spelled "ANDERW" on the back. "Height" was also misspelled as "HIGHT." When the error was pointed out, Leaf opted close the Buy It Now sales of the regular Prismatic card, which had a print run of 350 cards. However, 39 collectors are likely to be extremely pleased as Leaf has pledged to honor the completed sales. In a statement on Freedom Cardboard, Leaf's Brian Gray said that the Prismatic cards shipped will be serial numbers 1 through 39. Auctions for Prismatic parallels, including one for a one-of-one Super Prismatic version, were closed early after bids were cancelled. In his statement, Gray said all cards impacted by the error auctions would be destroyed. As soon as the auction started, action on the one-of-one card was frantic with bids soaring into the hundreds. All cards are going to be corrected and reprinted. Leaf expects to start selling them around February 7th in a similar fashion. Regular versions of the Luck card had no errors and remain up for sale. The card is limited to 500 copies and cost $9.99 each. Andrew Luck is one of the favorites to go first in the 2012 NFL Draft. The quarterback was a Heisman runner-up in both 2010 and 2011. He led Stanford to an 11-2 record this season, good for seventh spot in the national rankings. One of the biggest football prospects in years, collectors should expect a lot of Luck in 2012 and beyond. I was lucky to get one and won’t return it for a corrected one.I’ll just buy a corrected one. Nice snag. Either you’ve got a good conversation piece or a great return on investment should you decide to sell it. Do you think it’s worth grading? Jeff (ID 36485) � I don’t think it would hurt – if it looks like it will grade very high.